If you have a pet or a few pets, chances are you are familiar with urine accidents. 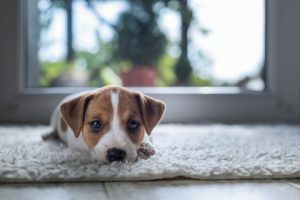 Pet urine can cause permanent damage to your carpet fibers. It can also create an unhealthy indoor environment. When urine is first deposited onto a carpet, it has a pH of about 5 or 6, which is on the acidic side of the pH Scale. It is easier to remove right then when it is fresh. When it dries it then turns “alkaline”, or to a high pH between 10 to 12 on the scale and becomes more difficult to remove. The warm acid state of the urine offers a perfect breeding ground for bacteria, which begin to flourish almost immediately. 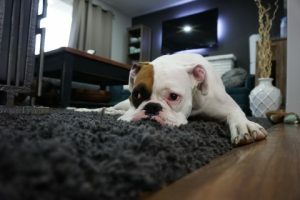 Some of this color change to your carpet can be attributed to the strong ammonia that forms as the urine passes through bacterial and chemical change. If left for days or weeks, depending on the fiber type, it will change the dye structure, and could cause permanent staining. Even if the soluble deposits are removed, the damage to the dye structure may already be done. These complex organic compounds will often work deep into the carpet fibers to a point of becoming part of the fiber. When dried urine is re-moistened, it gives off an ammonia gas. This scent is one that’s hard to forget! This can present a challenging situation, but there is hope! At Exquisite Carpet Cleaning in Joliet we use the latest technology to locate urine spots that are hidden in you carpet. A combination of using enzyme deodorizers and sub-floor extractors, we can offer a 100% odor removal guarantee. In most cases, any yellow spots are removed or at least lightened considerably.